Highly reliable motor controllers at low cost? Isn't this just what everybody wants? Well, yes it is! However, in this particular case it was helped by the fact that the controller in question did not require any additional inputs or added features. This was probably one of the simplest projects we have taken on in terms of actual electronic features required. The quality of reliability was also more relevant in this particular case as the application involved working in harsh environments. In addition, due to the volumes required by the customer, it was critical that the units had a long lifetime in order to prevent costly returns. The simplest way to develop a highly reliable based on the power specifications above would be to over-specify every critical component to such a level that it would be virtually impossible for it to fail. However, in reality, doing so would simply price the customer out of the market. The solution to this particular problem lies with extensive testing under a huge range of conditions. By carrying this out we were able to garner extensive data on the performance required and then specify components appropriately. Whilst all of our higher volume customers are price sensitive and work hard to secure the best deal when volumes begin to rise, in this instance the challenge was even more significant. As you will be aware if you have read our other case studies or even worked with us in the past, most of our customised or bespoke design work normally involves adding quite specific features or options. However, in this case the driver is particularly simple. The focus on reliability being the most critical aspect, we did retain some of our normal suite of safety features on the controller. These features included under voltage protection and a safety cut out. Both are important in their own right but also contribute heavily to the overall requirement of ensuring longevity. Future proofing electronics is always difficult but there are steps which can be taken to help. We worked hard to ensure we only used the most standard components in the design – any values or requirements that were considered non standard or at risk of obsolescence were not accepted. 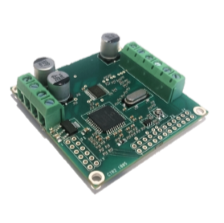 In conclusion, the central challenge of this board was to try and design a brushless DC controller which can perform week in, week out in a harsh environment and which can be manufactured at low cost for many years to come. By extensively testing the critical performance requirements of the controller, designing a solution which incorporates flexibility and minimises the risk of component obsolescence we were able to achieve this and meet the clients requirements.